Kashmir is a historical and ideological symbol for the BJP. Nothing in Kashmir is taken at face value, because nothing is as it seems. This is what Delhi has wrought there in the last three decades. And the Election Commission delaying assembly elections in Jammu and Kashmir but holding Lok Sabha elections is just more of that. Opacity in decision making, arrogance in communicating the decisions and underestimating the limits of Kashmiri patience have been Delhi’s trademark governance style. So, when the state’s overdue assembly elections – politically not very relevant, but meant to fulfill municipal needs of the citizens – were postponed, there was no felt need by the Election Commission to give any reasons for the decision. Although security was mentioned, the decision makes the atmosphere ripe for rumours and speculation as good as reality. The unionist parties – the National Conference, the Congress and the Peoples Democratic Party – are left wondering: What is the BJP schema? They have learned that there is nothing that that party does without a focused agenda. From their point of view, the delay could be a two-pronged attack. 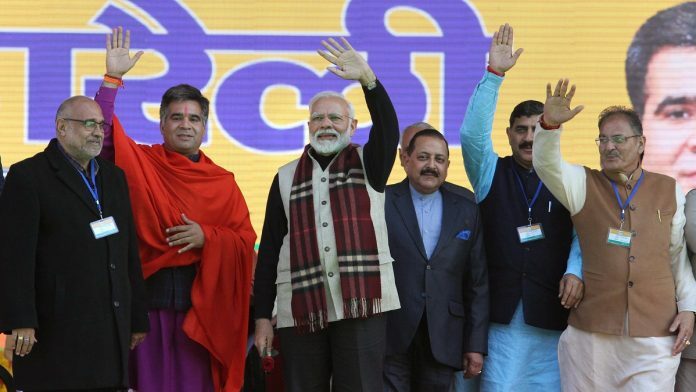 Although the BJP’s electoral fortunes have improved somewhat after Pulwama and its aftermath, there is no certainty about it. Most objective observers seem to think that a BJP return at the Centre with a reduced mandate is not unlikely. This is not good news for the BJP. It likes to be certain. Stalling elections for the Jammu and Kashmir state assembly, therefore, is a safe bet as a middle path. The best-case scenario for the BJP would be for the NDA to return with Narendra Modi as PM, even if with a dramatically reduced mandate. It would allow the Centre to extend President’s rule in the state for at least another six months. Today’s conventional analysis is that the BJP has lost ground in Jammu, its stronghold, because of intra-party dissension. This has happened because its state unit has been managed directly by the Centre, thereby eroding the autonomy of the local party cadre. It may result in the BJP reducing its numbers in Jammu to 20 at most and as low as 12 MLA seats at the least. Hate can only yield so much. In the event, the delay in elections would give the BJP time to aggressively gather votes before the assembly elections are held. A decent showing would allow it to be a part of a potential alliance, unless the non-BJP parties combine to form the coalition government in the state. Less of a rumour is the argument of the unionist parties that the BJP government have given the militant resistance and Pakistan what they want: the postponement in elections. But that speculation goes against the grain of the muscular, macho and self-righteous dispensation, which has been preceded by seven decades of failed state-building exercises by successive governments. The BJP is loathed to allow itself to be dictated to, much less being blackmailed. We must look to a longer-term motivation. Kashmir is a historical and ideological symbol for the BJP. It is bent on beginning Kashmir’s antiquity with a Hindu period – at the expense, it might be added, of several centuries of a Buddhist one, which not only intervened but contributed to the intellectual history, art and architecture of South and Central Asia. As for its history after the British withdrawal, the BJP sees Kashmir as the vanguard of a geographical Akhand Bharat that stretches south, east and west to several countries in South and South East Asia. It is to achieve this vision of their future that the BJP-and-family’s sights are trained on accumulating raw political power – starting from Kashmir. In other words, Kashmiris have gotten the measure of New Delhi and its antics. No matter when, how and with what degree of participation the elections in the J&K state are held, the number of votes cast will not be significant in Kashmir. There will be a government, it will start its politically motivated activities to deliver – or not – on promises made. But the dispute will remain, fester and return. In brief, in the long run, the speculation about the assembly elections in Kashmir are a superficial exercise. The political conundrum and security danger must be addressed. That is the bottom line. Siddiq Wahid is at present an adjunct fellow at the Institute for Chinese Studies in New Delhi and a scholar of Central Asian and Tibetan political history. He was formerly Vice-Chancellor of Islamic University and has taught in the United States and India. Unclear what the party really hopes to do in the state, politically. It had an unusual but promising opportunity in the coalition it formed with the PDP. That was comprehensively wasted. Mere pursuit and acquisition of power without any larger development or strategic vision can soon begin to pall.